Can anyone please help in identifying this individual? This photo is the only unidentified image in a collection of images taken by my grandfather, John LaDow of Elyria, Ohio c.1927-1932. All the rest have been identified yet this player needs a name. Other players photographed include Babe Ruth, Lou Gehrig, Tris Speaker, Lefty Grove, Earl Averill, Goose Goslin, Roger Peckinpaugh, Tony Lazzeri, Bill Dickey, and many more. Any help in identifying the player in this photo would be greatly appreciated. Please comment below or e-mail me directly. John LaDow was born in Hym, Hungary 1908 and immigrated to the United States aboard the R.M.S. Carpathia via Ellis Island, New York in 1910. Settling in and around the Cleveland, Ohio area he married his wife, Lois Lucille Crayton, in 1933 in Elyria, OH where they lived for 51 years. Baseball was always a passion in his life and he always found ways to be involved in the nation’s pastime. Whether going to Cleveland Indians games, traveling to other stadiums, watching and listening to televised or radio broadcasted games, playing billiards with the players in pool halls before or after games, or volunteering his time as a coach or umpire and scorekeeper for local Little League games, baseball photography was always a major interest. 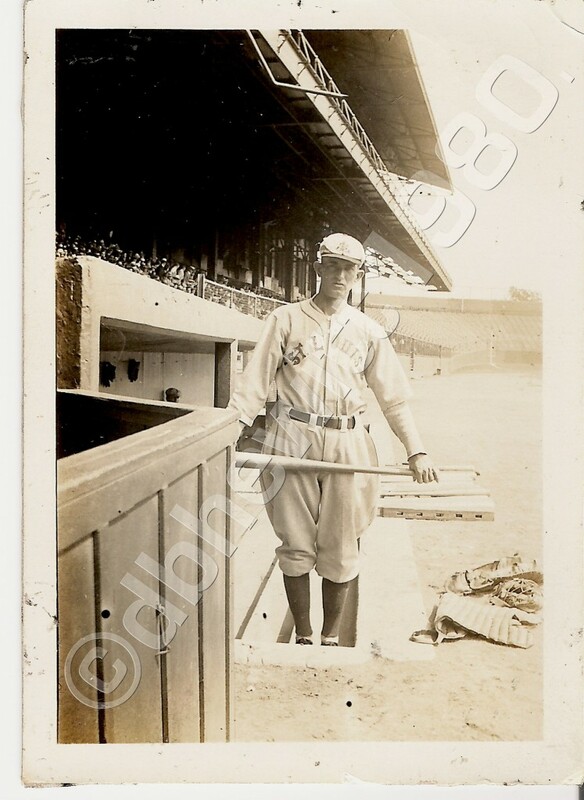 This image and all of the other photographs in the collection were all taken at Dunn Field (aka League Park) in Cleveland, OH when my grandpa was between the ages of 19-24. For many years, these photographs were believed lost and remained a memory until they were discovered in 1980. Several of the photos including images of Hall of Famers Babe Ruth, Lou Gehrig and Ty Cobb are now in the National Baseball Hall of Fame Archives. He passed away in Elyria, Ohio in 1984 at the age of 76. In 1994, Baseball: A Film by Ken Burns, an 18½ hour long epic documentary was broadcast as a series on public television and released as a 10-DVD set. During the 4th Inning, documenting the 1920’s and Babe Ruth, Ken Burns chose John LaDow’s photograph of Ruth and Lou Gehrig together in the New York Yankee dugout from the National Baseball Hall of Fame Archives for use in the film and with the “Ken Burns Effect” and commentary overlay. In 2009, my father, Geoffrey Hewitt, met Burns in Akron, OH and brought up the subject of the chosen photograph and of his relation to grandpa in conversation. Burns excitedly recalled the photo and was eager to know more about the photo’s origin and photographer. Burns was the director, producer, co-writer, chief cinematographer, music director and executive producer of Baseball. Four and a half years in the making and 18½ hours in length, the film covers the history of baseball from the 1840s to the 1990s. Through the extensive use of archival photographs and newsreel footage, baseball as a mirror of our larger society was brought to the screen over nine nights during its premiere in September 1994. It became the most watched series in PBS history, attracting more than 45 million viewers. Baseball received numerous awards, including an Emmy, the CINE Golden Eagle Award, the Clarion Award and the Television Critics Association Awards for Outstanding Achievement in Sports and Outstanding Achievement in Movies and Mini-Series. For what was once only a memory, grandpa’s involvement in baseball – and his photography – endures and will reach millions of more fans for many, many years to come. This entry was posted on Friday, October 9th, 2009 at 10:34 pm and is filed under Photos. You can follow any responses to this entry through the RSS 2.0 feed. You can leave a response, or trackback from your own site. Resembles catcher Rick Ferrell, I think.